Join our highly educational and fun-filled Yoga For Horse and Rider Clinic. Learn some great equine yoga poses and stretches to help keep your horse healthy, strong, flexible and performing well. Additionally, learn some yoga poses to help increase rider flexibility & strength and alleviate muscle tightness. 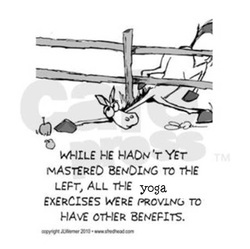 There is currently no Yoga For Horse and Rider Clinics scheduled.